The American Heart Association just concluded its annual "Scientific Sessions" conference, where heart experts gather to discuss and share findings about the latest treatments, procedures and studies about heart health and heart disease prevention. While many of the presentations targeted doctors to improve their knowledge and understanding about keeping hearts healthy and treating heart disease, some the presentations included information to help consumers understand how to keep their hearts healthy. 1. Don't rely on multivitamins to protect heart health. A large study of doctors found that taking a daily multivitamin didn't reduce major heart events such as heart attacks, stroke or death from heart disease. Many people take multivitamins under the false assumption that they will prevent heart disease or other medical conditions. This study, which was also published in the Journal of the American Medical Association, found there was no difference in heart attacks, strokes and other heart events between doctors who took multivitamins, compared to doctors who received a placebo. Arnett says the findings of this large study confirm previous smaller studies that found no heart benefit from taking multivitamins. "The American Heart Association has no recommendations for supplements except for fish oil," and that's only for people with very high blood levels of triglycerides, she says. Fish oil has been shown to reduce levels of triglycerides, a type of fat found in your blood, among people with high levels. 2. You're never too young to be at risk of heart disease. It's important for people to understand that heart disease isn't ageist when it comes to developing risk factors, as illustrated by the study showing that many younger people often do not get properly diagnosed for high blood pressure, Arnett says. The study examined young adults age 18-24 who had high blood pressure and regularly went to the doctor. The young adults were 28% less likely to get a diagnosis and treatment for high blood pressure, compared to adults aged 60 and older. High blood pressure left untreated can damage blood vessels, resulting in heart attack, stroke, kidney failure and heart failure. Ask your health provider whether your blood pressure reading is normal and - if the answer is no - whether you need treatment. 3. Your reflection may show a future heart problem. 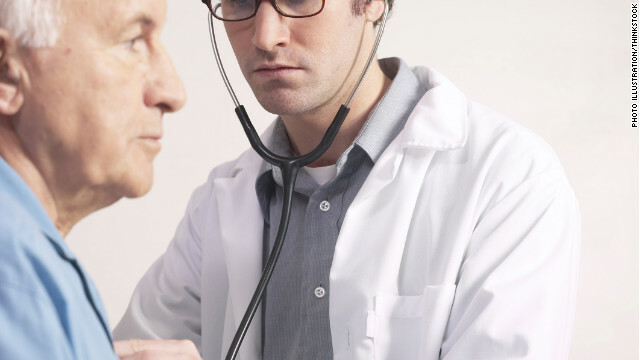 What you see in the mirror and what your doctor sees when he examines you may offer keys to future heart problems. Danish researchers found that people who had three to four specific signs of aging - receding hairline, balding at the crown of the head, earlobe crease or yellow fatty deposits (called xanthelasmata) around the eyelid, were at increased risk for heart disease and heart attack. Cardiologists have long known that people with earlobe crease and xanthelomas are at an increased risk, Arnett says. But this study tells people, "if you're getting three or four of those markers, it's a sign that you need to aggressively look at your risk factor levels and make sure that you check in with your physician about your measures." If you have some of these signs, she says there are actions you can take, including talking to your doctor, having your cholesterol levels checked, and working on controlling heart disease risk factors by eating a healthy diet, maintaining proper weight, exercising and not smoking. 4. Heart attacks hurt your wallet as well as your heart. Here's another reason why fighting heart disease and heart attacks is important: it has a wide-ranging impact on more than your anatomy. A notable study presented at the conference looked at the economic costs associated with having a heart attack or acute coronary syndrome, both on workers and employers, Arnett says. Researchers analyzed cost data including medical, pharmacy, short-term and long-term disability claims. "Everybody's health insurance costs are rising, and it's a concern for both workers and employers," Arnett explains. The average worker lost 60 days of work in the short-term after an event; short- and long-term disability costs for employers were estimated at $52,473 for long-term and $7,943 for short-term. The takeaway from this study, Arnett says, is "the importance of work site wellness and having programs that are available to employees to really understand how to embrace prevention." As I was surfing the net I was lucky that I found your blog. Seems an interesting outcome on your topic. It made me amazed. Thanks, keep on posting. I love your teaching so much.professor Arnett.Most NIGERIAN don,t believe in doctor that is why dey die so fast. Friggin' dumbest article on heart health or personal fitness I have ever read. "Look at yourself in the mirror ...." It's called aging and some folks are genetic prone to look older and lose hair early. With this type of verbal garbage, every balding man will be running to their doctor or cardiologist. So the best advice from modern medicine is that vitamins and food supplements should be replaced with prescription drugs because vitamins and supplements can't be patented and therefor it's a waste of time to include them in a treatment plan. Your Doctor is better off prescribing a specific pill so he can get a specific payoff. Vitamins, as a whole, have not really proven to be effective. Your body does not absorb them in the same was as nutrients from food. Your body just flushs them through your system. I had a heart attack. Changed my diet and exercised. I used a food program (not a supplement), called TruhealthMD.com. Lowered my bad cholesterol by 80 points. So it can be done, without drugs, but I do not believe multivitamins alone can be effective. A healthy diet with adequate exercise is the best way to go. Adding some extra supplements such as coq 10, pycnogenol, fish oil and a multi every now and then can help. We must eat more of nature's food and less man made food if we want to keep our hearts healthy. And yes you can do it. A little junk food here and there is probably not going to matter too much. Make sure you are in a job that requires some exercise throughout the day. Those other signs that the news report indicated were signs of possible future heart disease has some truth to it in my opinion. Baldies do have more heart problems than hairy ones but that is just an observance. The message here is make a change today now and yes you can do it. Life is precious and nobody wants to see someone die of a sudden heart attack. Once you make those changes then you have to hope for the best. Prayer should be a part of that too. Act now and things can change for the better. It has for me. Fantastic items from you, man. I've keep in mind your stuff prior to and you are just extremely excellent. I actually like what you've bought here, really like what you are stating and the way in which wherein you are saying it. You make it entertaining and you continue to take care of to keep it wise. I cant wait to learn much more from you. This is actually a wonderful website.